GALION — Galion’s Joni O’Leary was on a mission. She had seen a Missing Man Table in a restaurant out of state and knew we should share this honor in Galion. But how? A phone call to Miranda Jones at the Galion-Crestline Chamber of Commerce led to a call to Mike Mateer of Galion American Legion Scarbrough Post 243 and suddenly a team was formed to turn this dream into reality. The Missing Man Table — also known as the Fallen Comrade Table — often is used in a semi-0fficial capacity in military and service 0rganizations to honor fallen, missing or imprisoned service members. Several or these displays are being set up public this week to remind resident of the sacrifice of this nation’s fallen, POW and MIA personnel. The power and deep meaning of these provided O’Leary a memory of sacrifice and commitment she could not forget. All the team players were busy with other projects so close to Memorial Day, but this mission had to succeed. Tasks were divided and off went the team. O’Leary coordinated with local restaurants to obtain some of the needed items. Mateer and others at the American Legion obtained the remainder and boxed them for delivery. Jones and others with the chamber of commerce assisted in delivery and set-up. And O’Leary got started, other pieces began to fall into place. Fifteen local restaurants agreed to her concept. The Candi Bar donated the table linens; Toni’s Flowers the red roses. Christ United Methodist Church the Bibles for locations that could display them; Glen’s Surplus from Shelby donated the boxes for the items as well as many of the American Flags on displays; Crossroads Candles of Bucyrus donated the candles for the displays. The displays will be set up on Friday, May 25 at these restaurants around Galion and will remain on display until Monday May, 28. In no specific order those hosting the displays are: Bistro 217, Candi Bar, The Whistle Stop, Ralphie’s Sports Eatery, Wendy’s, Arby’s, East of Chicago Pizza, Subway, 1803 Taproom, Taco Bell, Pizza Hut, KFC, Burgar King and Payne’s Pizza. As you see these displays please respect and remember the fallen, the Prisoners of War past and future, and those still Missing in Action. Courtesy photo The Missing Man Table — also known as the Fallen Comrade Table — often is used in a semi-0fficial capacity in military and service 0rganizations to honor fallen, missing or imprisoned service members. 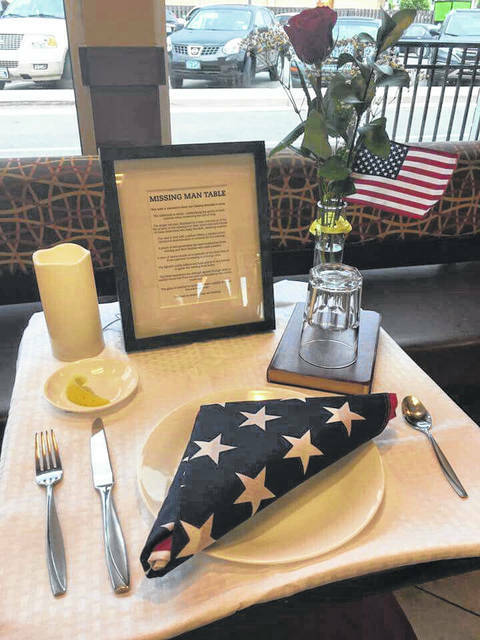 https://www.galioninquirer.com/wp-content/uploads/sites/38/2018/05/web1_Missing-Man-Table-JPG.jpgCourtesy photo The Missing Man Table — also known as the Fallen Comrade Table — often is used in a semi-0fficial capacity in military and service 0rganizations to honor fallen, missing or imprisoned service members.